It has been quite a few days for the Washington Wizards. 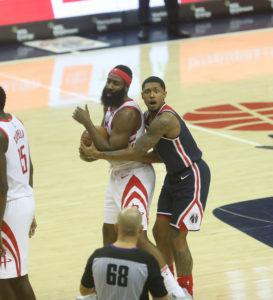 Plenty of rumors hitting the social media trail about who wants to be here and who is off participating in activities off the court, but that didn’t stop John Wall and his gang from taking James Harden and the Rockets into over time and emerging for their sixth victory in the last 9 games, 135-131. Harden, who seemed to be having his way with the Wizards late in the game finished with 54 points, but failed to find a way score in a meaningful way in the overtime period. John Wall scored a season-high 36 points, including six in overtime. Wall was able to keep Harden in check and even forced him into a couple passes that resulted in turnovers for the Rockets that converted into two huge buckets in the final minute that kept their lead safe. Harden, the NBA’s leading scorer, also had 13 assists, while Eric Gordon added a season-high 36 points. Wall had two baskets in the extra period and finished with 11 assists. Beal equaled his season high with 32 points for the Wizards. Beal was asked after the game about the Rockets backcourt dropping 90 points on the Wizards and if he thought they would be able to win with that type of production.